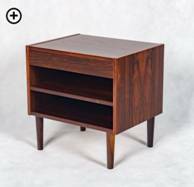 Made by CFC Silkeborg in 1957 it is one of the most iconic midcentury pieces of furniture. Designed by Kurt Østervig, Made by KP Møbler. Brazilian Rosewood with fantastic grain. 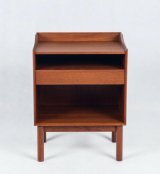 - Freestanding with beautiful Rosewood on the backside as well. Danish Vintage sidetable one drawers plus one shelf. Danish Antique - Travelling bureau sitting lose on high frame. 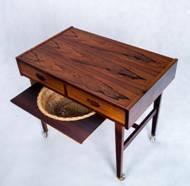 Walnut with inlays - absolutely gorgeous. Pictures over shows all the details. top. 4 small drawers with brass handles. Shelf half teak half cane. This is a charming little piece. Designed by Peter Hvidt and Orla Mølgaard. Will be searching for another one to make up a pair. Made by Haug Snekkeri A/S for Bruksbo. 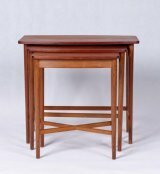 Danish Vintage nest of tables - rosewood with gorgeous red tiles. 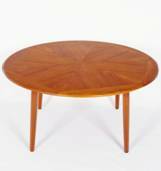 Danish Vintage Coffee table by Johannes Andersen Rosewood Coffee Table with Royal Copenhagen tiles. 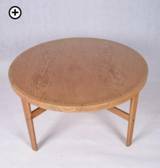 Danish Vintage nest of 3 tables - teak top and oak frames. Danish Vintage Rosewood Coffeetable on chrome base. Lovely condition and super quality. Has a veneer issue - reflected in the price. 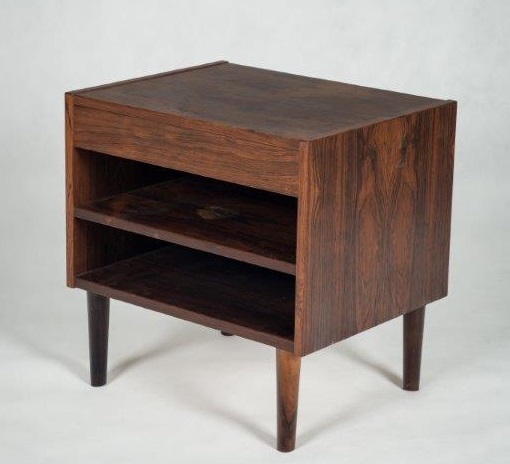 Børge Mogensen rectangular side table. Small Danish vintage sidetable with brown and white tiles. Brown laquered table top on chrome base. Made by France and Daverkosen in the 1960s. 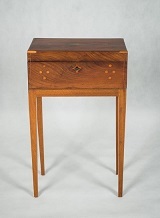 This is an elegant table with fine legs and lovely details. All solid teak with rattan shelf in great condition. Design by Henning Kjærnulf - Lovely condition.